Bob Arnce of rural Joplin wants no recognition or publicity for his actions in Brazil. He does not travel to the country for fame and glory. He only does it to serve God. “This is what I should be doing,” Arnce said. “If what I do here brings glory to God, that’s all I’m concerned about. Ten years ago, Arnce began coming to Brazil along with Pastor Wayne Wood’s traveling team. He joined the group at the request of the late-Mark Mayberry. In the last 10 years, Arnce has traveled to Brazil 18 times. Sometimes he comes with a group, other times he travels alone. 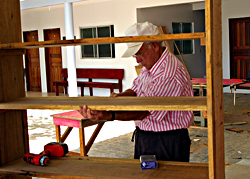 Arnce said he enjoys working at the International Christian Children’s Home in Maceio, because the projects he completes ensures the boys will receive a good start in life. However, he has other concerns that draw him to the country. “The ones outside of the (orphanage) fence are special to me,” Arnce said. “They boys in here, they’ve got it made [by Brazilian standards]. The ones outside of here, I’m concerned about. Arnce believes coming to Brazil fills a calling, placed on his life by God. Many of the boys, he said, never had a bed before they came to the orphanage. They also learn about Jesus, which is important, he added. “You do what little you can,” Arnce said. “I’ll do this as long as I can. 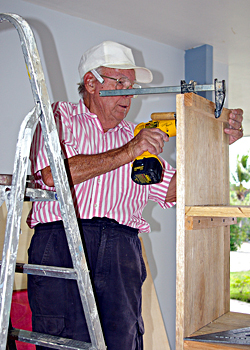 Bob Arnce, rural Joplin, works on a set of shelves for the new storage/classroom at the boys orphanage in Maceio, Brazil. This is Arnce's 18th trip to the country. Kaylea Hutson | JoplinDaily.com.